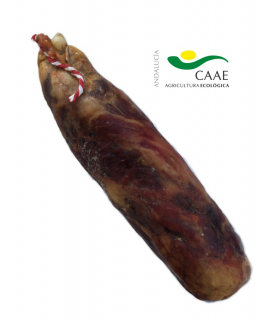 Iberian tasting pack consisting of 3 packets from different producers of acorn hams and a packet of cured acorn loin sausage. All you need to enjoy the flavors of Jabugo. Packet of 100g of Iberian acorn loin sausage. Made from the pig's loin (about 50 to 60cm) which is dried for about three months. 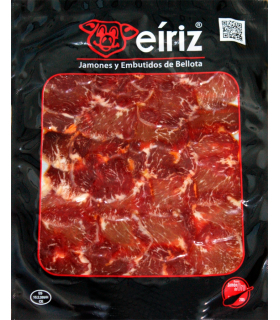 The Eiriz family produces a loin sausage whose high quality is recognised in the Jabugo region. The seasoning recipe has so far been kept secret. Assortment of 4 thin-sliced Iberian products - 400g. Perfect for sharing a taste experience with a group. We have selected three acorn hams from Jabugo (Onofre, Eíriz, Finca Montefrío - organic) and a 100% Iberian loin sausage (Eíriz). It is recommended that you open the packaging at least half an hour before tasting and leave them in a room where the temperature is above 18°. Tasting: smell the slice of ham before letting it melt on the palate to enjoy all the flavours of Iberian acorns. 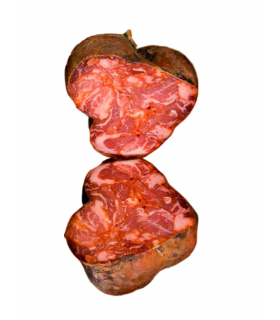 The loin sausage comes from 100% Iberian pigs, and is one of our discoveries of 2015. Try it and give us your feedback!